Turtles are weird. These are sauropsids with an armored shell enclosing virtually their entire body. The two halves of this shell—carpace on top, plastron on bottom—seem to have separate origins, and come together at a “seam” formed by osteoderms. Their elbows are backwards. Their vertebrae, having no mobility, have become elongated tubes connected to the underside of the carpace. The shoulder girdle sits vertically in the shell, seemingly within the ribcage, and in many turtles, the serpentine neck is able to retract into the shell. Other turtles are able to move their limbs into the shell as well. 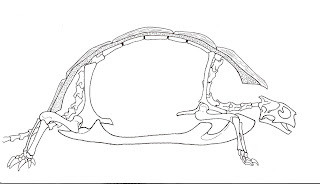 Skull shape varies wildly among turtles, but in all cases is an anapsid structure: like many basal sauropsids, the only fenestrae in the skull are for the eyes and the nose. While most modern turtles are semi-aquatic, at least one large group (the tortoises) are fully terrestrial and seem to like hot, arid climates. Other turtles are almost entirely aquatic—the sea turtles—who only come onto the beaches (with great difficulty) to lay their eggs. The retention of egg-laying is strange given that so many other sauropsid groups who returned to the sea gave birth to live young, including ichthyosaurs, nothosaurs, plesiosaurs, and mosasaurs. Turtles have outlasted all of those groups, having emerged during the Late Triassic and surviving well into the present day, yet the sea turtles never took a lesson from their live-bearing cousins. 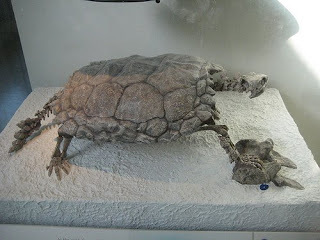 For over one hundred years, Baur’s Proganochelys (= Triassochelys) was the most basal turtle known. This Late Triassic turtle, about a meter long, was adapted to terrestrial life with a heavily armored shell, spike-covered tail, cranial spines, and smaller spikes coming off the neck. Unfortunately, Proganochelys told paleontologists little about the phylogenetic origins of Testudines. The problem with turtles is that they have a ridiculously derived body plan, totally different from any other animal, either living or extinct. Plenty of other amniotes have armor, but none have a body enclosed within a bony, armored shell. Glyptodonts came close to turtles, as their dorsal vertebrae and pelves fused to the underside of their massive patchwork shell. Placodonts, early shellfish-eating sauropterygians, came very close to the turtles in terms of shell design. Within Placodontia, two groups evolved different shell types. The smaller cyamodontoids developed a two-part carpace, with a broad shell covering the shoulders and most of the body, and a second smaller carpace covering the pelvis. Cymodontoids did not have plastrons. Another placodont, however, Henodus, had an incredibly broad carpace and plastron. Both halves were wider than the animal’s skeleton, and would have stuck out laterally from the body. Unlike cymnodontoids, however, the carpace of Henodus was a single broad structure that ran the length of the animal from the shoulders to the base of the tail. A trio of placodonts by Darren Naish. From left to right: Placodus, Placochelys, and Henodus. Placodonts, however, developed their shells in a different way than turtles. While turtles build their shells from a combination of expanded ribs and a small number of interlocking armor plates, placodonts built their shells with hundreds of very tiny osteoderms, much like the mammalian glyptodonts. Still more problematic is the fact that placodonts are unquestionably diapsids—their skulls have eye, nose, ear, and temporal fenestrae. Remember that turtles do not have any holes in their skulls behind the eye. So what are turtles? These shelled creatures have a wonderful fossil record post-origin point, much like pterosaurs and bats. However, their bodies are now so ridiculously derived that figuring out their relationships based purely on morphological comparison to other living groups of animals is an exercise in futility. Let’s use a more familiar example. Take whales, for instance. Let’s say that you were given the task of figuring out which living group of animals is most closely allied to Balaenoptera musculus (the blue whale) based solely on that whale. It would be easy to mark the whale as a placental mammal—it gives birth to live, developed young and nurses its babies. It’s endothermic, grows quickly, and moves its spine up and down instead of side to side. But after that, where would you position Balaenoptera among terrestrial mammals? Is it closer to lions than walruses, or perhaps cows and antelope? Hippos? Horses? The skeleton of Balaenoptera musculus. Have fun with that. The fact is, you need more basal forms. As any group of animals evolves, many of the features it once shared in common with other animals disappear. Balaenoptera lost its hind legs and teeth, retraced its nose to the top of its head, repositioned its eyes close to the jaw articulation, grew baleen along the gumline, and turned its forelimbs into powerful flippers. However, when you look at other whales, you quickly see that Balaenoptera (and other baleen whales) form their own cohesive group to the exclusion of others. Physeter, the sperm whale, does have teeth, as do belugas, narwhales, dolphins and porpoises. So those groups are more closely related to each other than to baleen whales. The more features a group has in common, the more closely related they are. And now that we have a good understanding of whale evolution thanks to wonderful fossil evidence, we can see how the cetacean body plan evolved, from terrestrial carnivore (Pakicetus) to semi-aquatic opportunist (Ambulocetus) to four-flippered doggie-paddler (Rodhocetus) to vestigal-hindlimbed giant (Basilosaurus) to more-or-less modern toothed whale (Squalodon). We can even see now the transformation between toothed, predatory whale (Janjucetus) to a whale with both teeth and baleen (Aetiocetus) to modern baleen whales. So what does that have to do with turtles? Well, modern turtles come in a wide variety of forms, from freshwater turtles to sea turtles to tortoises and enormous snapping turtles. Turtles are a monophyletic group—that is, all turtles share certain characters that indicate they all came from a single common ancestor. So even though snapping turtles look a lot different from matamatas, you can bet they both belong to Testudines. However, up until just this year, the earliest fossil turtle was Proganochelys, and it was already a more-or-less “modern” turtle. It already had the particular shell plate pattern you see in modern turtles and it already had a fully enclosed body with a large carpace and plastron fused in the middle. 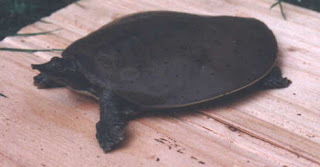 In some respects, especially its numerous spikes, Proganochelys did differ from modern turtles, but those features were probably unique to Proganochelys itself (or its family). So Proganochelys tells us very little about where turtles come from. In addition to supplying a relationship between pareiasaurs and chelonians, Gregory dismisses captorhinid, seymouriamorphs, and placodonts as turtle relatives. He proposes that turtles started out as a “pug-like” branch of the pareiasaurs, perhaps related to Elginia. In 1947, Olson proposed a reorganization of Reptilia into two branches, the Parareptilia (basically anapsids) and Eureptilia (diapsids), and that turtles rested on the former branch. In 1969, Carroll allied turtles with the captorhinids. 1997 saw two opposing papers in the same issue of Zoological Journal of the Linnean Society. In one, Lee proposed that turtles were pareiasaurs. DeBraga & Rieppel, however, used a broad array of amniote taxa in a large cladistic analysis to find that turtles formed a sister group to Sauropterygia, just like Jaekel had suggested 95 years previously. This proved to be a very contentious idea, but support mounted. In 2005, Hill published a large phylogenetic analysis that included representatives from a very large number of amniotes, and found turtles to be a sister group to the Lepidosauria. Hill used integumentary characters in addition to skeletal elements, and he emphasized their importance. But fossil evidence is still scant. Luckily, 2008 saw the discovery of who wonderfully important new turtles, one complete, one not so much, and new embryological evidence for how the shell forms in modern forms. Chinlechelys suggests that armor was present in the terrapin ancestor. Related to the question of rib expansion is scapular position. The turtle shoulderblade seems to sit within the ribcage, while in all other vertebrates, it is positioned dorsal to the thoracic ribs. At this year’s SVP, Lyson & Joyce demonstrated that once your remove the bony shell elements, which are not homologous to other tetrapods, and reduce the expansion of the ribs, it turns out that the scapular blades, while still vertically oriented, frame the neck and sit anterior to the thoracic ribs. Lyson & Joyce implied a relationship with basal amniotes due to the position and orientation of the scapulae. 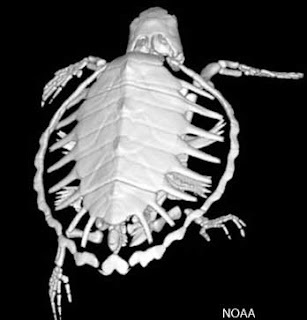 What’s important, though, is that the authors showed another important feature of how the turtle shell develops—the ribs expand, and those expansions are filled in and covered by unique ossifications. As Chinlechelys has shown, those ossifications are then fused with overlying dermal armor. Let’s talk about that. 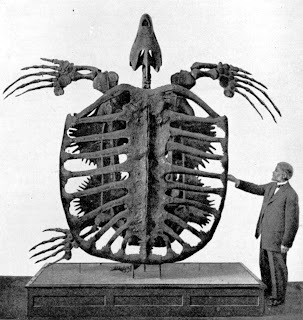 Notice how the ribs are expanded, but not to the extend you see in modern turtles. Additionally, there are no costal plates or shields. The animal does preserve a row of small neural plates running down the back, a feature present in modern turtles. The skull is long but still anapsid, with a long neck and tail. The plastron is complete and remarkably large, with flared corners which seem to overgrow the width of the ribcage. But what about that plastron? There’s your fully-developed plastron! Aside from its flared, “combed” edges, the plastron is modern and surprisingly large. A ventral view of the skull gives a look at the dentition, with teeth in both the upper and lower jaws, premaxilla and maxilla. The authors of Odontochelys propose that this new turtle simply doesn’t have a carpace, that the plastron developed first, and that because Odontochelys was probably a semi-aquatic turtle, that turtles evolved in a marine environment. Furthermore, their phylogenetic analysis places Testudines firmly within Diapsida, and again supports a sister group relationship between turtles and Sauropterygia. In the “News & Views” section of Odontochelys’ issue of Nature, Reisz & Head suggest that Odontochelys lost its carpace due to its semi-aquatic lifestyle. They point to the fact that it has neural plates, so the carpace isn’t entirely absent. Indeed, what if Odontochelys had osteoderms that were not preserved? Actually, the modern soft-shelled turtle has both reduced its bony carpace and lost its dermal armor entirely. Leatherback sea turtles reduce the costal plates and shields, and ancient Archelon reduced its carpace to almost nothing but neural plates and ribs! 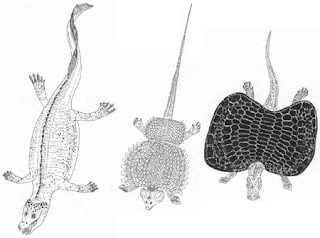 Notice also the flared "combed" plastron edges in the leatherback (middle) and Archelon (bottom). Odontochelys gives us competing hypotheses about the turtle shell. Either Odontochelys descended from a shelled ancestor, or it simply did not have a carpace, but its neural plates form the first part of the structure. Chinlechelys further muddies the picture, as it suggests that the ancestral turtle did have thin dermal armor--which is either absent or unpreserved in Odontochelys. What is exciting, though, is that Odontochelys, as the most basal turtle known, gives paleontologists a better opportunity to figure out the taxonomic position of Testudines among other sauropsids. Just like with whales, the most basal your taxon, the better your chances of figuring out who it is related to. A string of evidence from the last decade suggests that turtles are, in fact, diapsid reptiles related to Sauropterygia. So turtles really are close to placodonts, despite their differences in shell construction! Interestingly, if turtles are removed from Anapsida (or "Parareptilia"), that would mean that the only living sauropsids are diapsids! If turtles are pareiasaurs, they would be the sole representatives of a very ancient lineage, but it's looking worse and worse for the parareptiles. 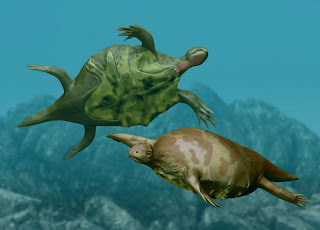 We still don't have a Testudine Archaeopteryx, but it's been a good year for basal turtles. I can only hope that a shell-backed urvogal remains buried somewhere, awaiting discovery, and I look forward to reading about it! A special thanks goes out to, who provided those wonderful skeletal drawings. I tell ya--you kids and your digital media. You're zooming past dinosaurs like me who use traditional tools. This old dog's got to learn a new trick or two! The most bizarre restoration of Odontochelys I've come across, from Wikipedia. EDIT: I do plan on adding a reference list, but perhaps tomorrow. This post already took three hours to write (most of that is research). I'm also going to add another awesome drawing from Matt, so keep an eye out! Modern great white sharks, which occasionally prey on sea turtles, tend to attack prey from below (most of their prey items breathe air). There is some indirect evidence that Carcharocles megalodon (or Carcharodon, if you prefer), may have fed in a similar fashion on whales (Godfrey and Altman, Jeffersoniana 16, 2005). Large (great white-sized) sharks were contemporaries of Archelon, which retained a large plastron even as the carapace was reduced. I wonder if the large plastron either was retained or developed first in Odontochelys as a defense against sharks or other large predators attacking from below. That's the thinking in the Odontochelys paper, too, actually! For what it's worth, sharks from the Wayao/Falang/Xiaowa Fm. (whatever you want to call it) tend to be fairly scarce and wimpy (as were Triassic sharks in generally, with a few notable exceptions). There are however, some other nasty fish (Birgeria and Saurichthys) and plenty of other marine reptiles. I heard there was hot and cold running Celeskey. Where's the tap?